Front Row: Brandon Huff and Landon Everett. Middle Row: Coach Tyler O'Connor, Jay Nightingale, Nick Pearson, Tyler Rummel, and Coach Shelby Hoppes. Back Row: Connor Koehn, Kinser Colgin,and Coach Ted Regehr. 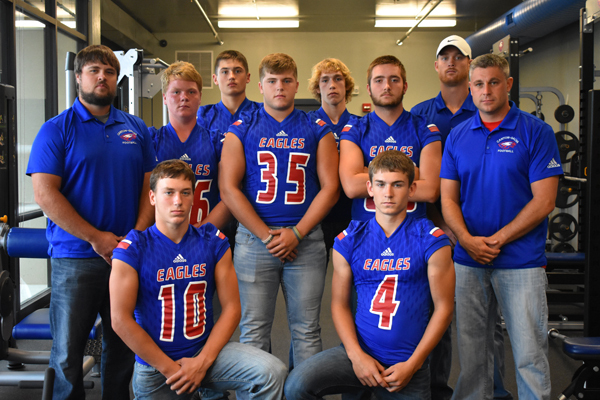 With no seniors, the Canton-Galva football team will rely on younger players to get them where they want to go this season. Led by Landon Everett (QB/DB), Nick Pearson (TE/DE), Jay Nightingale (OL/DL), Mason Reedy (OL/DL), and Kinser Colgin (WR/DB), Canton-Galva hopes to just get better each week of the season. The Eagles start out the season with one of the toughest opponents of the year, as they will hit the road and face Little River. They finish non-district with Chase County and Centre, but the district schedule sets up nice for the Eagles as they get three of their five games at home. Canton-Galva finished the season last year with a 4-5 record and out of the playoffs. With their eight returning letter winners they hope to improve on that and make the playoffs.